WIOA is returning to Murray Bridge for the South Australian Conference & Expo to be held at the newly completed Murray Bridge Racing Club. Consider sharing you stories with other water professionals by presenting at this important event. 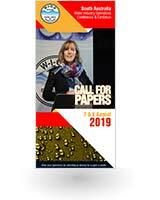 One of the highlights of the event was the awarding of the Best Presentation Award that provides an all expenses opportunity to present the paper again at the 2019 WIOA Queensland or NSW conference. Sponsored by Hydramet the Award was won by Mel Slimming from South Australia for her presentation on financial savings and efficiencies made at the Port Pirie wastewater treatment facility. Congratulations to the team who made the conference happen, as the first of its kind in South Australia I found it an invigorating and positive experience, which highlighted the benefits of idea and experience sharing and the water industries willingness to engage with these activities in South Australia. Murray Bridge Racing Club was established in 1899, and held its first race meeting at its Maurice Road location in 1914. The new Gifford Hill Racecourse development at Murray Bridge is on track for an early 2019 opening as work commences on the new $20 million Function Centre and Race Day Facilities Building.